Rediff.com » Business » Will Hrithik's magic work for Reliance? Will Hrithik's magic work for Reliance? Reliance Communications has rolled out a 360-degree Hrithik Roshan campaign to mark its entry into the GSM space. Is the message reaching out? The advertisement opens with a shot of Hrithik Roshan with guns in his hands, a la James Bond, inside a dark shed. It's actually a film shoot for the young Bollywood star. The director says cut and several crew people are seen changing the shot. The camera then moves to Roshan's makeup room. He comes and sits on a chair, tired from the scene he has enacted. As he settles down, something crosses his mind and he smiles to himself. 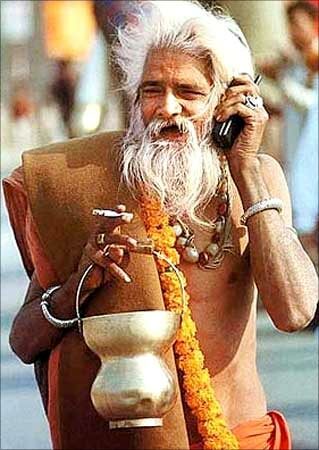 He dials a number from his mobile phone. A man fishing in a like reaches out for his ringing mobile phone. At first, he thinks the call is for his son and is about to hand it to him, when he recognises the voice. He cannot believe it. He excitedly leaves his fishing rod and chats away on the phone. Roshan, looking very pleased and content from the last call, dials one more number from his phone, this time to his school teacher. The old woman who picks up the phone doesn't believe it's him and says, "What do you think? I'm mad or what?" To jog up her memory, Roshan says, "Ma'am, class eight B, the green-eyed boy." The old teacher exclaims: "Duggu." Cut to a very busy stock broker who is juggling several phones at the same time. Just then his mobile phone rings and he answers it. The stock broker too looks pleasantly surprised upon getting a call from the well-known actor. Image: More takers for mobile phones. While Roshan is reminiscing about the calls he made, a woman walks in and informs him that the next shot is ready. He nods at her. An old man fixes the lights up at a stall when his phone rings. A little scared to hear his mobile ring in the middle of a shoot, he quietly picks it up. Roshan, while talking on his mobile phone, surrounded by few set crew people, looks up and waves at the man. He realises it's Roshan calling to thank him. He smiles warmly and gives the actor his blessing. The ad closes with a shot of Reliance Communications' colour bars and a voiceover that says: Don't wait, go for it. 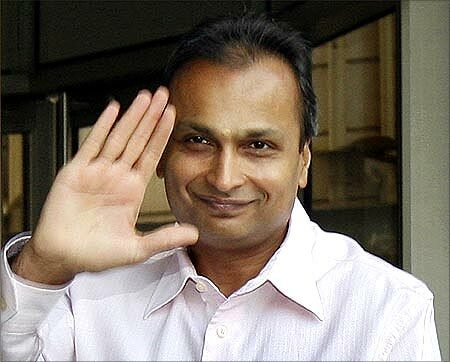 Image: Reliance Mobile is part of ADAG, headed by Anil Ambani. This 60-second campaign marks Reliance Communications' much-talked about entry into the GSM space. Until January 2009, Reliance was present only in the CDMA space, which accounts for just about 20 per cent of the market for mobile telecom services. CDMA services are used at the lower end of the market, while GSM customers yield better revenues -- hence the shift. With this move, Reliance Communications has signalled that it is ready to take on big GSM players like Airtel and Vodafone for a pie of the market. Similarly, the Tata Group has joined the GSM bandwagon -- it will launch its services later this month under the brand name Tata DoCoMo. Given the importance of the task ahead and the threat of new entrants, the Reliance Anil Dhirubhai Ambani Group company is not taking any chances. Thus, it has roped in style icon and superstar Roshan as its brand ambassador and is reported to be spending over Rs 50 crore (Rs 500 million) on this campaign alone. Additionally, the campaign will be a full 360-degree one using outdoor, print, radio and digital technology to the hilt. What's more, Reliance Communications will make good use of Roshan's celebrity status too. To that end, the company is using his voice at their customer call centres for recorded messages. In the online space, a digital Roshan is enabled to connect calls between two numbers. With this in mind, the brief given to the telecom operator's agency of three years, Cartwheel, was simply to announce the launch of the pan-India launch of the GSM service in a simple yet engaging way. "At the same time though, we wanted to re-energise the brand," says the company's brand and marketing head, Sanjay Behl. A few weeks of brainstorming later, Cartwheel zeroed in on this particular idea. "Reliance has always been known as a brand that gives you value. We wanted to take that same equity forward. Further, we wanted to show that with a phone one can be impulsive. So if you have a thought, Reliance Communications allows you to go for it," explains B Ramakrishna, the founder director of the agency. Image: M S Dhoni is Aircel's mascot. As for the choice of celebrity, Behl believes he's hit the jackpot. "For one, Roshan is an iconic figure who cuts across markets and classes. Two, he's not overexposed on celebrity endorsements; so he brings a fresh feel to the ad," says he. Not surprising then, the actor has been appointed brand ambassador of the whole company and will be endorsing everything from value-added services to direct-to-home television. 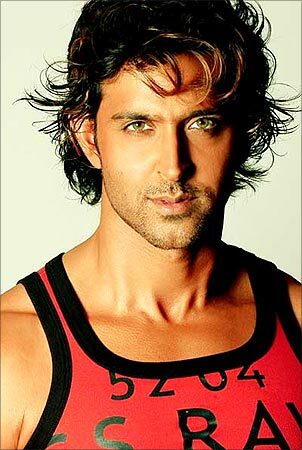 Image: Hrithik Roshan is popular with advertisers. The ad which broke on May 30 will run for about six weeks and may be extended if needed. It has five different executions with nine edits that took about eight weeks to make. In the coming weeks, four more executions of the ad will roll out. The ad breaks at a time when market leaders Vodafone and Airtel are running successful campaigns of their own. 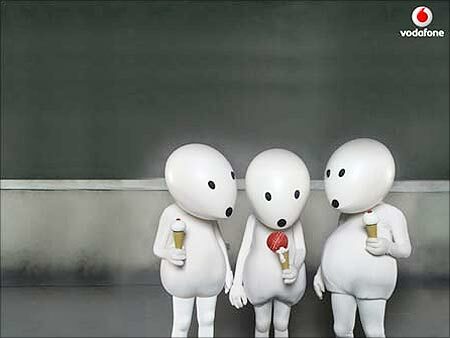 Vodafone saw unprecedented success with its Zozoo campaign which broke during the recent Indian Premier League season. Airtel's ads with actors Madhavan and Vidya Balan may not have been as talked about, but they conveyed the character of the brand and highlighted human emotions yet again. 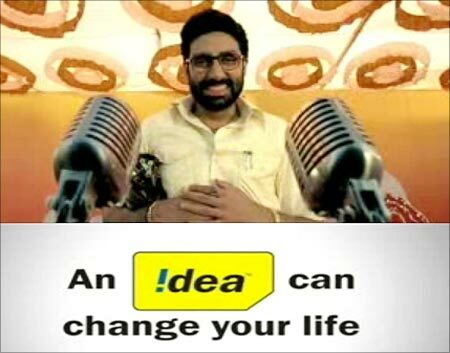 Not far behind the two is Idea Cellular 'Democracy' campaign with Abhishek Bachchan as the brand ambassador. Tata Indicom has focussed on the age-old problem of bad network with people constantly saying 'hello' as a result of this problem. Meanwhile, late entrant Aircel has launched its campaign with Mahendra Singh Dhoni, the Indian cricket captain, as its brand ambassador. The ads are simple and have mainly focused on value-added services, a growing attraction for consumers. What is clear is that each one of these brands has a separate identity of its own. Behl isn't perturbed. "Each brand has to play to its strategy. These brands have been around for a long time and I don't want to play a competitive game." Ramakrishna of Cartwheel hopes that with this television commercial, Reliance Communications will be able to differentiate itself from the rest of the herd. Image: Abhishek Bachchan stars in Idea's innovative 'What a democracy' campaign. However, brand consultants and advertising veterans are sceptical. "This ad makes it seem like Reliance Communications invented the mobile phone. It says nothing about the brand or what it stands for," says an advertising head who does not wish to be named. "We know Airtel's personality and we know Vodafone's personality. What is Reliance's personality?" Brand consultant Harish Bijoor of Harish Bijoor Consults is also apprehensive. "I believe this ad doesn't work. It's like forcing an emotion on the consumers. Reliance Communication's image should be even more mega than Airtel and it should touch the bottom of the pyramid." 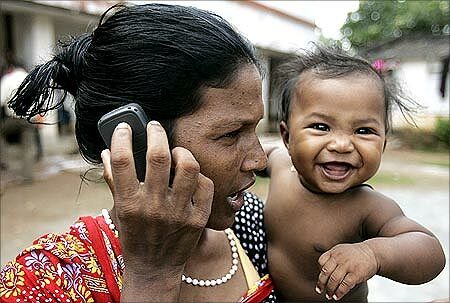 Image: A girl from the Dhimal tribe, one of India's smallest tribal communities, talks on her mobile phone. Luckily for Reliance Communications though, even before the ad released, its foray into the segment has met with success. The service which was rolled out in seven circles in January has, according to the company, already got about 10 million GSM subscribers. This takes its total GSM and CDMA subscriber base to 74.8 million and gives it a 20 per cent share of the whole market. Moreover, the nationwide GSM launch, it claims, has been instrumental in increasing its share of new subscriber additions to seven per cent for the first four months of this year. And by the end of the year, Reliance Communications hopes to improve this figure to 25 per cent with a target of 100 million subscribers overall. To achieve that, the company has kept the entry fee at a meager Rs 25 and offers five to ten minutes of talk-time free every day for three months. Besides, Reliance Communications' brand awareness is 95 per cent, a figure Behl hopes will bolster his business in the days to come.